EP CarrilloThere are 6 products. Ernesto’s blends usually combine tobaccos from different countries and regions. 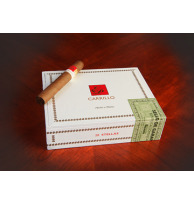 His Cuban-seed tobacco from the Dominican Republic blends perfectly with Nicaraguan tobacco to deliver a medium-bodied cigar that features rich and creamy flavors.